This illustration by Kristin Noelle arrived in my inbox during her Santa Pause course in December. It was a whispered gift of understanding, and I'm thankful that she is letting me share it with you today along with why it meant so much to me. My uncle died unexpectedly before Thanksgiving. And in the days after the holiday, when family had left and the house was quiet again, I had trouble sleeping. I would wake up after about three hours and my mind would suddenly remember and my heart felt so confused in that deep grief of knowing we wouldn't ever talk again. I would think about the postcard on my studio table that I'd written him but hadn't sent. I would try to remember what we talked about when I saw him for the last time almost five years ago. And I'd tried to hear his voice inside the memories of childhood joy. Sometimes I would stay in bed, trying to sleep. More often I would read or get up. The days that followed felt thick with sadness and exhaustion. Grief sat next to me on the couch and quietly walked behind me when I would get up to go to the studio. It would catch me unaware in the lines of a Christmas song. And it would consistently wake me up. One night while getting ready to crawl into bed, I picked up Jeero, a stuffed animal that sits on my bedside table. He's flat and kind of like a small pillow. I got into bed, pulled the covers up to my ears, turned on my side, and cuddled him to my chest. And I slept all night. And it worked again the next night and the one after that. I've slept with him almost every night since. I couldn't put into words why it was working until Kristin's email came with this illustration. It helped me see that in the confusion of grief I just needed something to hold on to. I just needed something simple that wasn't about sharing my feelings or worrying I was grieving too much or bringing up all the other stacked up complicated feelings that can happen when someone dies. Jeero the stuffed animal just shows up. He doesn't make it about him. He's just there, like a warm hug, letting me be me. And the truth is, in hugging him, I was giving myself the gift of taking care of me and listening to what I most needed. I'm so grateful to Kristin for putting her stories and illustrations into the world so that others can recognize themselves and feel less alone. And for giving me permission to know it is okay to be a grown-up and to just want things to be as simple as a hug from a stuffed animal sometimes. Kristin Noelle is a Los Angeles-based illustrator. She creates soulful art that fosters a worldview of trust. 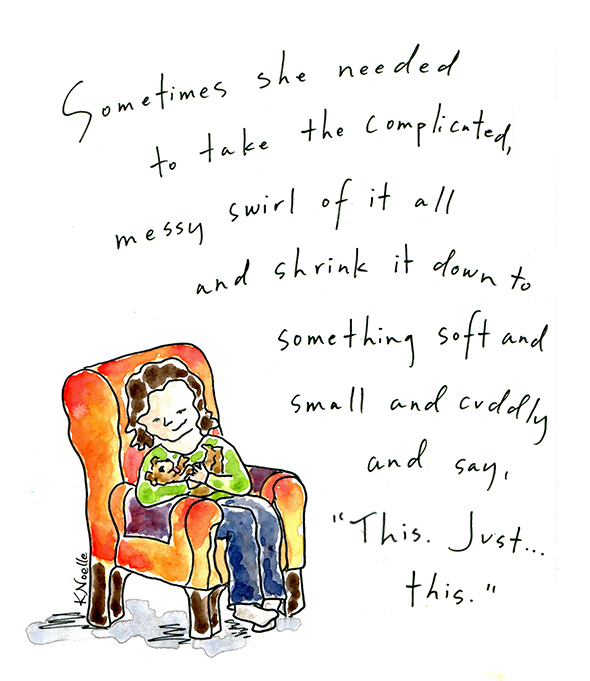 Find her at www.kristinnoelle.com and be sure to check out Blessings - a 10-day series of inspired, illustrated blessings. Blessings is your chance to taste, for free, the work that Kristin will be offering the world all year through themed series of illustrations - on love, relationships, grief, parenting, money, and more.